Ancient kush kingdom in sudan -Remind you of Kush? The Map shaws geograrhical postion of Africa in 400 B.C.Here I am posting some recent news about naming of south sudan ,the country get its independence in recent Months. There was proposal to name it Kush republic … but finally it named south sudan. For your kind information the national anthem of is sudan is “Land of Cush” . Does it mean that We forget them and Sudan remembers them? Now let us look at some recent news about Sudan. Now Read “The origin of pagan idolatry ascertained from historical testimony …, Volume 3” By George Stanley Faber (page 403) Old Testament carries the History of Kush and we forget. (NEWSER) – Southern Sudan already had a flag and an anthem when its people voted to secede and split Africa’s biggest country in two; the nation-in-waiting now has a name as well. The secretary-general of the ruling party, keeping things simple, says the name South Sudan has been chosen, the BBC reports. Other names that had been considered included Nile Republic and Kush, the name of a kingdom that existed in the region thousands of years ago. After independence there will be tons for Southern Sudan to do, but they already have a soaring national anthem. After 23 brutal years of civil war, 2 million lives lost to ethnic violence, and a brutal revolution, southern Sudan is having its moment: this week they Vote on a referendum for independence. It is almost certain they will vote yes and Africa’s largest country will split in two. After that, predictions are less certain. We don’t even know what the new country would be called. Possible names in contention: South Sudan, Southern Sudan, New Sudan, Kush Republic, Nile Republic.The national branding blog has a good discussion of this choice. The official break from the north wouldn’t take place until summer. Before that there is a long to-do list. Borders would have to be settled, assets, or more accurately, $21 billion in international debts, have to be divided between north and south, oil revenues will have to be shared—the oil lies in the south but needs to be piped through the north for export. Among all this though, one task is complete: the national anthem is set. The committee has … told those taking part in the competition that the anthem should be about freedom, peace, equality and prosperity and also praise those killed during the conflict between southern and northern Sudan. Perhaps the most interesting part: the lyrics were written by a committee that included members of the government and military. Imagine, in the US, if our Congress and Marine Corps were tasked with writing the national anthem. September 20, 2011 — On 9 July 2011 South Sudan ended an era of marginalization by declaring itself as independent Republic of South Sudan. On 8 August precisely 30 days later the first President of the Republic of South Sudan, Salva Kiir Mayardit, declared to the nation that in the first 100 days of the new government 30 new primary schools and 4 new secondary schools will be under construction. Of interest here is the relocation of the capital of the Republic of South Sudan from Juba to Ramciel and the President’s declared targets or goals to be achieved within 100 days of the new government. Presumably the period of the 100 days is with effect from 26 August, the day the new government was announced. 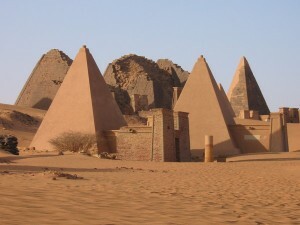 Now let us look at historical facts of kush kingdom in sudan. The Kingdom of Kush or Kush was an ancient state centered on the confluences of theNile ,white Nile and river Atbara in what is now the republic of Sudan. Established after the Beronze age collapses and the disintegration of the New kingdom of Egypt., it was centered at Napata in its early phase. After king Kashta (“the Kushite”) invaded Egypt in the 8th century BC, the Kushite kings ruled as Pharaohs of the Twenty fifth dynasty of Egypt for a century, until they were expelled by Psamtik in 656 BC. During Classical Antiquity, the Nubian capital was at Meroe in early Greek Geography.The Meroitic kingdom was known as Ethiopia. The Nubian kingdom at Meroe persisted until the 4th century AD, when it fell to the expanding Kingdom of Axum.. The Kingdom of Kush is one of several names used for the region of Africa directly south of ancient Dynastic Egypt, approximately between the modern cities of Aswan, Egypt, and Khartoum, Sudan. 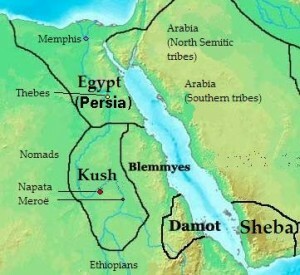 The Kingdom of Kush reached its first peak between 1700 and 1500 BC. In 1600 BC they allied with the HYksos and conquered Egypt beginning the 2nd Intermediate Period. In 750 BC, the Kushite ruler Piye invaded Egypt and established the 25th Egyptian dynasty during the 3rd Intermediate Period, or Napatan period; the Napatans were defeated by the Assyrians, who destroyed the Kushite and Egyptian armies. The Kushites fled to Meroe, which flourished for the following thousand years. In 716 BC, Kushite pharaoh Piankhy died, and his brother, Shabako, succeeded him. After the Kushite pharaohs had conquered Egypt in 728 BC they stretched their control over to Palestine. Archeological work in Jerusalem revealed more than 200 Egyptian/Kushite weights dating back to the period. About this same time, the Egyptian bureaucracy rebelled against the Kushite rule. Pharaoh Shabako launched a strong military force, marched over Lower Egypt, traced the rebels and defeated them, and established Memphis as the official capital of Egypt. In 706 BC, Shabako made his son, Shebiktu, the second person after the Pharaoh responsible for overseeing and regulating the affairs of the colonized Egypt. Shebiktu maintained a peaceful policy with Sargon of Assyria who was extending the empire’s impacts on the Near East. In 704 BC, Sargon died in Tubal, and his death brought hopes of independence to the Near Eastern districts that fell under his empire. Taking advantage of this situation, Shabako, the Kushite Pharaoh, supported the anti-Assyrian rebels including those in Syria and Phoenicia. One year later (705 BC), Sennacherib succeeded Sargon on the Assyrian throne. He destroyed all the rebellions, starting with those in his homeland in Mesopotamia (including the Babylonian and the Chaldaean rebellions), marched west to reconquer the territory lost after Sangon’s death. By this time (around 702 BC), the Kushite Pharaoh Shebiktu succeeded his father on the throne. Following his father’s steps, Shabikto continued to support the anti-Assyrian movements. By 701 BC, Sennacherib was advancing from the Syrian Desert west to the north of Phoenicia to attack the Phoenician stronghold of Tyre, which was, at the time, a semi-island off the coast. For some reason, Sennacherib was not able to subdue this city. Tyre was obviously a strong state; it was also evident that it was a close ally of Kush and may thus receive support from Kushite military troops. This is an incomplete list for rulers with the titles of Qore (king), and Kandake (queen) of the Kingdom of Kush. Some of the dates are only rough estimates. While the chronological list is well known only a few monarchs have definite dates. These include those leaders who also ruled Ancient Egypt. Dates are definite and accurate for the Kushite rulers of the Twenty fifth dynasty of Egypt, when Egypt was invaded and absorbed by the Kushite Empire. The dates also are certain for kings Aspelta ,Arakamani, Nastasen, and for the Kandakes Shanakdakhete ,Amanirenas,Amanishakheto, Amanikhatashan. Al -kuru Pyramid in South sudan Depicts Ruler's pictures. Al –Kurru was one of the royal cemeteries used by the Nubian royal family. Reisner excavated the royal pyramids. Most of the pyramids date to the early part of the Kushite period, from Alara of Nudia to king Nastasen (beginning of the third century BCE). The area is divided in to three parts by two Wadis. The central section seems to be the oldest and contains several Tumultus type tombs that predate the Kingdom of Napata. Kussara is located in Afar, Ethiopia. Latitude and longitude are 11.3333° N and 41.0333° E. We provides local travel information on indoor outdoor activities and holiday ideas. Kussara (Hittite: Kussara) was a city of Bronze Ages south-eastern Anatolia. The rulers of Kussara extended their authority over central Anatolia, conquering Hittite -speaking Kanesh (Ganesh? ), destroying the future Hittite capital of Hattusa, and subjugating territories as far north as the Black Sea. People of Sudan remembers our Cush lunar dynasty and we? Look how they created Hindustan in Africa too. Kenya named after Kumaon (named a language Kimuru). TANZANIA IS NAMED AFTER TANGAN KUMAON TIRBE OF DEVBHUMI. One of My friend “Vikramsigh Bhadoriya” sent me Link and says that “Meghshran Tuareg” ruled Taureg empire of Mali (Africa). Herewith I Am providing you The Link sent by Shri Vikramsinghji. Link -1 to Mali History. You may not believe in Mr. Bhadoriya’s words ..but I Believe. I believe that Kimuru (Kumaon languge) was spoken in Tanzania and Kenya. The people of Devbhumi reached there and named “Meru Parvat” . you will be surprised to know that “Luo” tribe (Lion) also dwell there among Meru and Ameru tribes in Tanzania. And Barack Obama also belong to Luo tribe pl. Still you dont Beieve? Then Look at follwing Link. The site says that Malla Kings of Kumaon belong to Tangan tribe. They migrated from Tibet. Pl.Read page no.59 of The book. It says “TANGAN IN SANSKRIT MEANS BORAX.WHICH HAS BEEN USED TRADITIONALLY TO PURIFY GOLD.TANGUNS WERE THE HILL PEOPLE OF INNER GARHWAL HIMALAYA,WHO USED TO GATHER GOLD DUST AND PURIFY IT WITH BORAX. THE INERIOR GARHWAL WAS KNOWN FOR THEIR GOLD MINES.THERE IS PLACE NAME CALLED “TANGAN CHATTI” SOME 22 K.M.FROM CHAMOLI ON BADRINATH ROAD.THESE TANGANIAN CLANS OF KHASA RAJPUTS IN GARHWAL AND ALMORA “.Please read page 114 too. The history conencts them with Mahabharata. YES THE kIMRU (kUMAON) TRIBES REACHED UP TO TANZANIA.THEY NAMED MOUNTAIN “MERU” THERE. THEY ARE KNOWN THERE AS MERU TRIBE. THERE ARE LUO AND AMERU TRIBES ALSO THERE IN TANZANIA. ONWARDS WE LOOK THAT HOW AMERU TRIBE REACHED AMERICA AND FOUNDED AMERU VALLEY IN ANTIQUITY BEFORE COLUMBUS REACHED THAT LAND. YA THERE ARE ANCIENT INDIAN TRIBES DWELLED IN AMERICA..WHEN COLUMBUS REACHED THERE. THE PRESENCE OF KUMAON (EURPEAN CYMRU) TRIBE IN TANZANIA AND ITS CONNECTION WITH SUDAN COMPEL ME TO SAY THAT THRE WAS KUSH KIGDOM IN SUDAN. kUSH ,YOUNGER SON OF SHRI RAM.NOW I KNOW THAT PHARAOH OF EGYPT WELL REMEMBERED BY EUROPE AS WELL AS BY THAI KINGS OF CHAKRI DYNASTY. Still you don’t believe that Meru people of Kemya has connection with Kailash ? We know that Tangan people of Devbhumi came from Kailash( Tibet). Then Tangan word transferd to Taureg when they reached in Dark continent. Tangan belonged to Gauda vansha. Anek Malla was King of Kedarkhand. History of Uttaranchal syas that Tangan belonged to Vairatha Kula .In Tanzania Waarusha people in on the slop of Mount Meru. Yes Kilmajaro is clue to Almora. Now we know tradition of Burhaditya sun temple of Katarmal. The temple carrying ancient tradition of Kilmora flowers. The temple utencils used to wahsed with Kilmora flowers.Lau nandan knows presence of His brother Kush in ancient Sudan…..! Surprisingly there Tohono O’dham ancient tribe in Arizona (America). They were worshipers of Shiva even thugh they embraced Chritianity now a days.Thier ancient Shiv temple is Intact position opposite site of Arizona Church. They are also Gold washers, who reached America prior to Columbus. The following Links will say you evrything…..evrything. Now we know that ancient history of Middleeast /Africa /Europe and America was history of Amorite tribes. Amorite that is tribes of Amarawati, capital city of Indra. Amorite tribe history says that cush was father to Nimrod. Sargon the Great appears to be the world’s first dictator, ruling over the Mesopotamian area circa 2500 b.c.). The Bible Almanac identifies him with Nimrod of Gen. 10:8–10. Gen. 10:8, 10 reads: Now Cush became the father of Nimrod, and he became a mighty one on the earth. And the beginning of his kingdom was Babel and Erech and Accad and Calneh, in the land of Shinar. From that land he went forth into Assyria and built Nineveh and Rehoboth-Ir and Calash and Resen , between Nineveh and Calash—that is the great city. In the 11th year of his reign, Sargon the Great, sent an envoy to the land of the Amurrû, intending to procure materials for his great building projects. The record of this event reads: the land of the West to its limit his hand reached, he made its word one, he set up his images in the West, their booty be brought over sea. Apparently there are omen texts which back this up. One reads: he went to the land of the Amurrû, defeated it, and his hand reached over the four regions [of the world]. Another reads: he went to the land of Amurrû…struck it for the second time [and] his warriors…brought him forth from the midst. This could refer to two expeditions, which would allow for one to take place in the 3rd year and another in the 11th year. According to ancient records, Sargon’s envoy must have gone as far as Mari on the Euphrates and on into Syria. History Devbhumi says that Tangan Malla tribe came from Tibet and ruled our Devbhumi. Tangan tribe carried history of Amorite tribes. Now we know that same Amorite tribes reached Tanzania and Sudan. 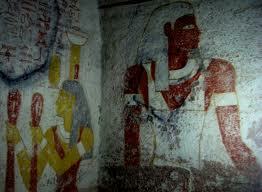 The Cush kingdom mentioned in Sudan carry history of Cush -father of Nimrod. Still you Don’t believe ? Luo Martial tirbe of Kenya and Tanzania will say you History of Lav nandan in Africa. Then Cush Kingdom belong to Cush vanshis ? Ya it is reality that we never accept. I THANK HONOURABLE VIKRAMSINGH BHADORIYA WHO HELPED ME TO FINAD LASTING TRUTH OF THE SUBJECT……NOW WE SHALL SEE ,HOW THIS TRUTH CONNECTS AMERICA AND INDIA. This entry was posted in mythological news. Bookmark the permalink.